VANCOUVER, BC / ACCESSWIRE / April 3, 2019 / BTU METALS CORP. ("BTU" or the "Company") (BTU-TSX:V) announces it has commissioned Zen Geomap Inc to conduct a low-altitude, high resolution drone magnetic survey of its Dixie Halo properties contiguous to Great Bear Resources in Red Lake, Ontario. The survey is expected to include over 80 flights, covering a grid of 827 line kilometres. In addition to high-resolution magnetics, the survey will include 20 flights for the purpose of air photo mapping. Data will be processed and mapped with the objective of honing the drill targets on the Company's current six identified areas of focus, particularly around the northern border of the BTU property. The drone survey will also investigate a large part of the minimally explored areas of the 12,963 hectare property to investigate further areas of interest and supplement targets. The survey is planned to begin within the next two weeks and take approximately two weeks to complete. 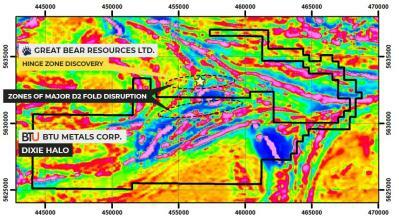 Doug Hunter, P.Geo and BTU VP, Exploration commented, "High-resolution was a critical tool for neighboring Great Bear Resources in identifying D2 folds and gold-bearing structures. The survey will be flown very close to the ground and we greatly anticipate the three-dimensional image output to assist in identify potential gold-bearing structures on the BTU land". Figure 1: High Grade Hole DHZ14 Drill plan map over colour mag 1VD data. BTU Metal's property surrounding that of Great Bear resources is shown in black outline. To view reports and maps of the Dixie Halo Project please visit https://www.btumetals.com. The drill hole intersection reported on the property location map is not on the Company's Dixie Halo Property. Mineralization that may be hosted on adjacent properties is not representative of mineralization that is, or may be, hosted on the Company's Dixie Halo Property.